I roamed 7 cities in the Yangtze River Delta in seven day, traveling by bus and visiting sites. In the following few SFM installments, I will describe some of my observations. Shanghai has truly grown in the 20 years since I first visited it on business. Most people are familiar with its new skyline, the shopping streets, the many eateries and the fine museums. I made a point of taking a ride on the new magnetic levitation (maglev) train that connects the city with its new airport. This is the only commercially operating maglev train in the world, built with German technology. The ride lasted only about 8 minutes and covered about 30 km. For a few minutes, it flew one inch above the track at 430 km/ hr, or 267 miles/hour, or at 1/3 the speed of sound. My impression: WOW! If I were not running out of time, I would have taken a few more round trip rides for the thrill. It is better than anything Disneyland has to offer. 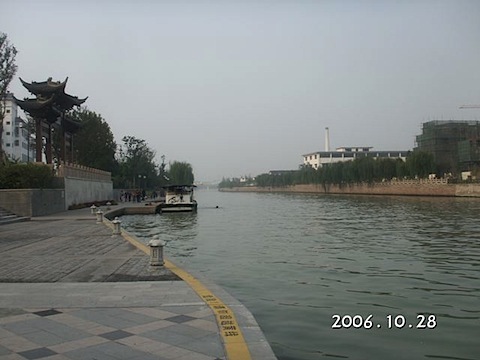 I always marveled at the audacity and the vision of Chinese emperors to build the Grand Canal 1,400 years ago. This inland waterway connects Hangzhou with Beijing, bringing the bountiful products of the South to the political center in the North. 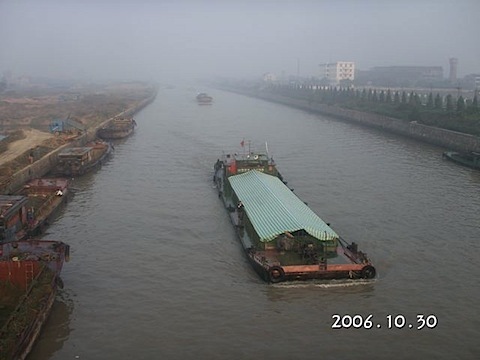 I wanted to take a cruise on the Canal and feel the enormity of this ancient lifeline of the Chinese economy. At a few cities along the Canal, I tried to find passenger boats that would carry me from city to city. Nobody in the cities had any knowledge of such cruises. Then I tried to find freight boats and hitch a ride but failed also. Apparently, the modern super highways system has made traveling by bus to be so cheap and convenient that the Grand Canal has been reduced to a grimy freight conduit. The ancient and disused Grand Canal that skirts the city of Yangzhou (of Yangchow fried rice fame) has been turned into a beautiful recreation waterway. A man was taking a dip in the Canal when I took this picture. The main channel of the Grand Canal is lined with construction sites, quarries, docks and industrial complexes. It is now strictly a sweaty working waterway. I saw one line of 13 barges being pulled by a single tug boat. This probably still is the most inexpensive way to transport freight. Posted by Robert Wu on Monday, November 13, 2006, at 9:50 pm. Filed under Uncategorized. Follow any responses to this post with its comments RSS feed. You can post a comment or trackback from your blog.